On Tuesday night when the temperature plunged to nine degrees and the wind chill to -10 degrees, Terry Montgomery was trying to heat his home on Tyler Street with a space heater. Montgomery was nervous the landlord had stopped paying the heating bill because he had just gotten a letter saying the landlord hadn’t paid the tax bill, meaning the house is likely headed for auction. Montgomery wants to move out, but his immediate need is to stay warm. It is tax foreclosure season in Detroit. In the first few days of April, a judge will issue foreclosure judgments on homes with unpaid tax debt from 2016 — even if it’s for a few hundred dollars. Right now more than 45,000 homes are subject to foreclosure. Not all of these homes have people living in them, but when they do it is most often renters — more than half of occupied and foreclosed homes last year were rentals. These renters have been calling and texting us over the past few weeks, some are absolutely panicked and some are calm. None of them are resigned because they all want more information about what they can do to keep their housing situation stable. Many, like Montgomery, have even more pressing housing issues. The past few weeks have been busier than any others since we started our news service three years ago. We are reporters doing triage. We put leads for investigative stories coming from these calls in a spreadsheet so we can get back to them later, we are updating and maintaining the integrity of the data we have but not working on new programming to automatically compile more online data we need. We’re paying for FOIA data and title searches because we don’t have time to be cheap. At the same time, because we are such a small operation, we have to spend a tremendous amount of time raising enough money to sustain us for another year — something that is by no means guaranteed. Balancing these competing needs is just the rhythm of the day and I am almost never overwhelmed until I confront, in my weakest moments, how audacious it is to put my faith in such a fragile premise. I ask others to believe it too. To believe that information alone can be valuable enough to make a difference. My belief system lets me down almost every day. Information hasn’t moved the needle for Terry Montgomery and we knew from the outset it was likely to go down like this. The accountability gaps around utility service in Detroit are so gaping that the work of one small news organization is not enough. State regulations say a utility can’t shut off heat for a renter when it is the landlord who owes money. This information seems powerful but it is useless. Our utility provider, DTE, wouldn’t tell Montgomery or us if there had a been a shut-off or if the heating system was just broken. The only person who can learn if there has been a shutoff is the account holder, which is the landlord in this situation and he already has the information. Renters can’t assert a right they can’t pin down. A city regulation says rental properties have to be inspected and property without heat would fail. Montgomery was able to get an inspection because we knew who to call, not because we knew they were required. A dedicated person on the city’s communications staff made sure all of our unreturned voicemail messages to the Buildings Department resulted in an emergency inspection. Three skilled reporters worked on this over two days. We doubled down even though we knew we were unlikely to change anything. As of today, Montgomery still doesn’t have heat. He held back his rent in an attempt to push the landlord to respond to his questions. Now, he also has an eviction notice and yesterday morning part of his bedroom ceiling fell in. Montgomery sent us pictures of the mess. It is kind of him to do so even though we haven’t been able to be very helpful yet. If he hasn’t lost faith in the power of sharing and demanding information, it makes it less likely that I will. I need to keep the faith that our work is not meaningless. Reporting, when done with care and intention, can be a true service; this is the only idea I have ever truly evangelized. We are able to give most of the Detroiters that we talk to the information they need. When we don’t spend all day on these calls I know we’ll be able to devote more time to reporting that exposes corrupt systems and practices. When I say I know this, I mean today I’m refusing to have a crisis of faith. Outlier is service journalism on demand. We deliver high-value information directly to news consumers over text message and offer every user the ability to connect directly with a reporter. Txt OUTLIER to 73224 to see how it works. If you’re looking for important info on any home in Detroit delivered right to your phone txt DETROIT to 73224. Outlier is service journalism on demand. We deliver high value information directly to news consumers over text message and offer every user the ability to connect directly with a reporter. Txt OUTLIER to 73224 to see how it works. 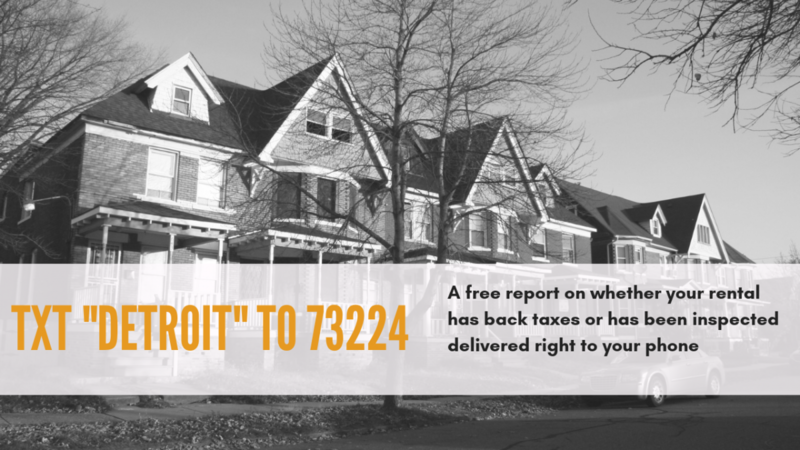 If you’re looking for important info on any home in Detroit delivered right to your phone txt DETROIT to 73224.